becoming better at compassion – Love. Life. Practice. Sounds like you’ve been travelling a lot lately. I feel like I should give you some Zen-based advice, like, we are all one, therefore you are always home. Or, identify the particular feeling of being home that you desire – like peace or familiarity – and then find another way of achieving that around you. This message from a friend was one of the nicest things I’ve ever heard in response to me talking about my travel-weariness. It is far better than those who try and reason or distract away homesickness. One of the faults of the Information Age is that we all have access to the wisdom of the ages…which means that yes, while we can share it with each other, the odds are that the person we’re sharing it with already knows it. I can name a zillion ways to combat loneliness. I can point out strategies and tactics for improving moods and even for rejuvenating your road-worn psyche. And I can do that for a large part because I, like you, have access to the Internet. That’s why I try not to serve up such platitudes, or at least attempt to put a personal twist on them. What my friend did, after that gentle reminder of things I already knew, that soft invitation to remember them, was send me a couple of pictures, landscapes of sublime beauty from places I’ve never been. It was a reminder that the world may be tiring, but it is also lovely; and that reminder helped, immensely. We talk a lot about the practice of compassion in the personal development community. Perhaps we should think more about exactly what that looks like…because I’m pretty sure it doesn’t look like a quote, but more like a beautiful valley or bright-lit mountain peaks. Sharing beauty, not just the idea of beauty. Does that idea change anything? Eh, didn’t think so. 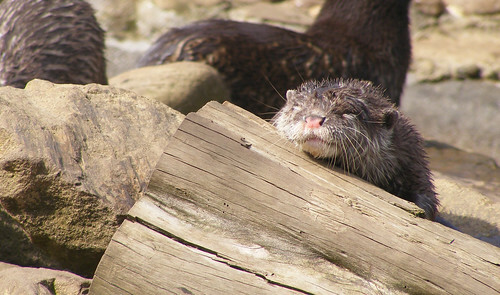 Here’s an otter, instead. Much more likely to make you happy. I’m reminded of the Romanticism movement of the nineteenth century and their desire to find a sort of zen-like connection to wilderness.